After graduating from St. Bon’s in 2014, Katie Harris kept her childhood dreamof becoming an astronaut close to her heart. She went on to graduate from the University of Toronto this past spring with a Bachelor of Science (Honours). She double majored in Astronomy & Astrophysics and Physics and minored in Anthropology. After finishing up in Toronto, Katie left this summer for Strasbourg, Alsace, in North East France. There she is pursuing a Master of Space Studies degree from the International Space University. Katie will focus on 7 core areas throughout this program: Human Performance in Space, Space Policy and Law, Space Management and Business, Space Humanities, Space Science, Space Engineering and Space Applications. She is now working on courses, which will be followed by a team project, her individual thesis and an internship in industry. 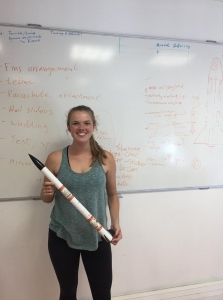 Recently Katie took part in a rocketry workshop, where in teams of 6-7, the Masters of Space Studies students built small rockets in less than two days. These rockets carried a vial of Russian vodka, a quail’s egg, a camera and an altimeter to an altitude of 100 meters! We are thrilled to see Katie continue to shoot for the stars, and we can’t wait to see where she ends up next! Hillary Simms ’12, an exquisite trombonist, completed a Bachelor of Music at McGill University before moving on to Yale, where she graduated with a Masters of Music this past spring. The day after her convocation, Hillary joined the Yale Concert Band for their concert tour in Australia. 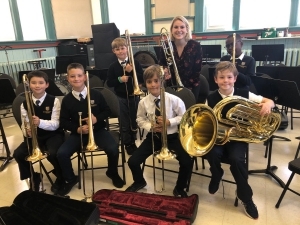 Following the Colorado Summer Music Festival, Hillary went straight to the Aspen Summer Music Festival, where she spent two months as the Chamber Symphony Music Fellow, performing as principle trombone of the top orchestra out of 4 full orchestras. She also had the opportunity to study with Jim Miller of the LA Philharmonic and Tim Higgins of the San Fransisco Symphony.